My Grandmother owed and operated the Marina that you are at right now until the 1970s. It was called the Anchorage then. Her name was Agnes (Schrader) Lutz. Everyone called her “Aggie”. She fished, hunted, made her own fish nets and decoys. 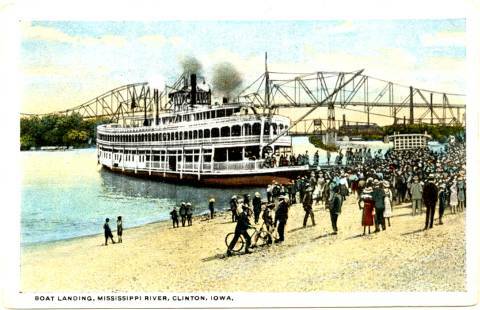 She was named the first queen of our 4th of July “riverboat days”. She could best any man around with a shotgun hunting for ducks on the river. I have a scrapbook on her. I read about your adventure in the local newspaper and decided to tell you that you can get a book or two at the Clinton Public Library that describe life on Beaver Island (just downriver from where you’re docked). Before the lock & dam system was built (causing flooding) there was a small town there and a couple of little farms. Also you can check with the owner of Shafer’s Fisheries that is just north of Fulton Illinois (right across the river), the owner can tell you all about commercial fishing in this area. If you can go there be sure to get some smoked carp (not the Asian carp) and enjoy it with some cold beer :-) Good luck to you two!